When presented with the question of whether we prefer “fiction or non-fiction”, most would probably consider the two most obvious extremes: fiction and documentary. But, on which side of the battle do films such as 12 Years a Slave, Into the Wild, Catch Me if You Can, The Pianist, and The Killing Fields fit in? Of course, the answer is both. It’s true that we live in a world in which so many inspiring, heartbreaking, exciting, and terrifying things happen that it can seem hard to justify the time and effort it takes to make up a good story for a film. Of course, fiction provides a creative outlet through which we may experience things that we couldn’t in the real world; it allows us to disconnect by immersing ourselves in other worlds – even those that are dangerous or scary – from the safety of our position as a spectator; and most simply provides us with the magic of creation: it never ceases to amaze me that something may exist simply because we wish it, something unique and new, an emotion or thought or moment that once recorded (whether in writing, on film, or any other artistic medium) may remain untouched for us to revisit whenever we please, and ultimately leave behind. On the other hand, where a film’s purpose is to educate – to deliver facts and observe, analyse, and/or explain a process, event, or subject – the documentary will always be king (and the genre is most certainly not going anywhere fast; consider for a minute the popularity of the BBC’s nature “docuseries” in recent years, for example). But often amongst all the facts and dates are individual stories that deserve need to be told: not only to save the story itself, but to save emotion from being lost in a sea of faceless statistics and dates, a concept immortalised by the infamous Stalin quote “When one man dies it’s a tragedy. When thousands die it’s statistics.” (or any of the other variants of the line, in this case that of Russian historian Anton Antonov-Ovseyenko). This is where those films that straddle both life and art – with their stories adapted into screenplays and directed with entertainment and artistic vision in mind – come into their own. The intention here becomes not to passively and impartially educate per se, but actively instigate an emotional response, and whilst usually striving to remain true to the source materials (aside from any necessary truth-bending or gap-filling to benefit the telling of the story), the line between fact and “fiction” (for lack of a better word) may already have been blurred; most of these films are based on personal accounts rather than the quantitative analyses of academics, and so are inherently shaped and coloured by emotion, opinion, and bias. But in this instance it’s capturing these most human and emotional facets, rather than just communicating cold hard facts, that matters the most. Given the real-world importance of telling these stories it’s little surprise that this challenge so often attracts the very best in the business: just try to find a year in which the Academy Award nominations for best actor/actress does not include at least one for a portrayal of a real person (hint: it has happened only twice in the last 50-odd years, and not once since the late 70s). 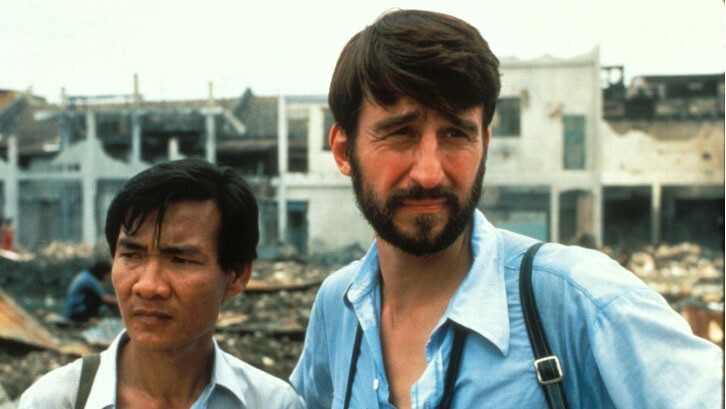 The Killing Fields is one such film. Nominated for no less than 7 Oscars (winning three), 13 BAFTAs (winning 8), and 6 Golden Globes (winning one) amongst countless other awards around the world, and bathed in the plaudits of critics and the public alike upon release (and over the 34 years since, often appearing in “top/best films” lists); this telling of the time shared by Pulitzer-winning journalist Sydney Schanberg (portrayed by Sam Waterston) and photojournalist and interpreter Dith Pran (Haing S. Ngor) – from the start of the Cambodian civil war to the “year zero” policies of the Khmer Rouge’s reign – surely shouldn’t need much more justification to convince you to give it a watch if you haven’t already. Of course, the value of a film cannot be measured in prizes and nominations alone. Everyone I have ever discussed this film with has gone away wanting to know more about the wars that plagued arguably one of the planet’s most beautiful regions, inspired to watch documentaries on both the Cambodian and other civil wars and genocides, and wanting to read the protagonists’ journalism from this time (which earned Schanberg a Pulitzer amongst other accolades) as well as learn more about their lives and careers both before and after the events of the movie. This film certainly set in motion a domino effect in my own choices of watching and reading materials – from historical fiction to documentary, and everything in between – attracting me to works I may have otherwise overlooked (most recently Madeleine Thien’s Do Not Say We Have Nothing, which spans China’s land reform campaigns, cultural revolution, the Tiananmen Square protests, to the present day). If this film aimed to raise awareness as well as entertain, it most certainly seems to have achieved both goals. It was released in 1984, not even a decade after the events of the film, during the Cambodian-Vietnamese war (which ended in 1991), and within only five years of the end of the Cambodian genocide and removal of the Khmer Rouge from power in 1979 (but not their dissolution; they completely surrendered in 1999). The film remains powerful to this day, but I can hardly imagine the impact it would have had upon its release. It was largely shot in neighbouring Thailand, into whose borders the war spread. Whilst violence in Thailand was largely limited to the Thai-Cambodian border, and so the risk to those involved in making the film presumably low, the film’s proximity to the conflict it was portraying is certainly unusual. Thai authorities wholly supported the film (including lending air force planes repainted in Vietnamese characters), seeing its value as a vehicle to bring the conflict to international attention. Very much related to my previous observation, many involved in the film’s production were not descendants of the survivors and witnesses of the horrors portrayed in the movie, but the survivors themselves. That they should wish to face such a horrific past so soon to tell the story is both humbling and a reflection of the importance of its being recorded and shared with the world. Winning an Academy Award is widely considered to be something quite special. Doing it with your first on-screen acting role – and as one of only two non-professional actors to have ever won it – arguably makes the feat impressive even compared to other winners. But that this feat might be one of the least significant in Dr. Ngor’s life (and yes, he really did train and practice as an obstetrician and gynaecologist) almost beggars belief (and is testament to the gravity of the trials he had to face). Remember when I said that statistics can hide stories deserving to be told? Well it turns out that Dith Pran’s was told by a man with a story of his own, which Ngor would later tell in his memoir Survival in the Killing Fields (which I cannot recommend highly enough): the story of his surviving torture, imprisonment, forced labour, and the loss of his loved ones at the hands of the Khmer Rouge, despite being a doctor, buddhist, and glasses-wearer (intellectuals, those with “intellectual traits” such as wearing glasses, and religious people were targeted in the regime’s policy of classicide). After the events of the film, real-life Pran joined the New York Times in 1980 as a photojournalist alongside Schanberg (who would however leave the paper in 1985), with whom he remained friends until his death in 2008. Haing Ngor continued to work as an actor until his murder in California in 1996. 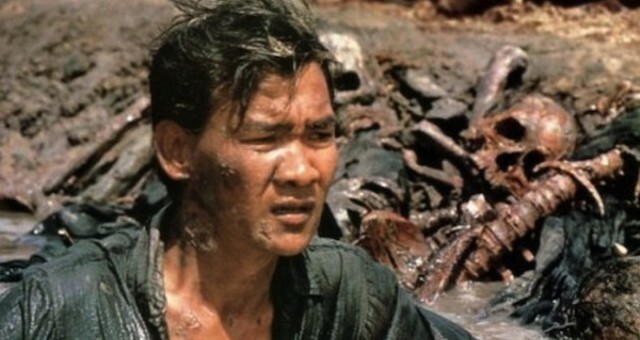 The film ends with Dith Pran (Ngor) saying “There is nothing to forgive”. How I wish we lived in a world where that were true.